Nice pic, too. I can't recall ever making clam sauce in cast iron, but it looks great with the knotty pine counter. I use that pan for everything I can...Perfect size for GF and I, and high edges so I don't get the ingredients splashed everywhere..The old pine table came with the house. GF finished it this past summer..
One of my jobs over the weekend was doing a major clean out of the fridge, and several things in the freezer. Washed down all the glass shelves in the fridge, wiped down the sides, and threw out several jars and bottles of condiments that may have been OK, but not taking a chance....plus several of them were down to less than a third or so of the contents. So...to answer your question in the original post, CG....I used up a lot of leftovers over the weekend and did a small grocery shopping today for produce and to replace some condiments, but went out to lunch and brought home leftover ribs and cabbage slaw for this evenings dinner. We had store bought tortellini with a sauce with no tomatoes. I took ideas from the thread where I asked for suggestions for a sauce with no tomatoes. It had butter, EVOO, chopped garlic, three anchovies, chili flakes, white wine, and cream. When the tortellini was cooked, I tossed it with the sauce, some freshly grated Parmagiano Regiano and chopped parsley. That worked really well. Taste was perfect and it really improved the store bought tortellini. Wow, that sauce sounds good. I'm going to make that. I don't need an exact recipe, I think I can wing it. I will probably switch out the chili flakes for some homegrown chilis I have in the freezer from last summer. Sounds really good, Taxy. I'm glad you found a non-tomato sauce that works for you! 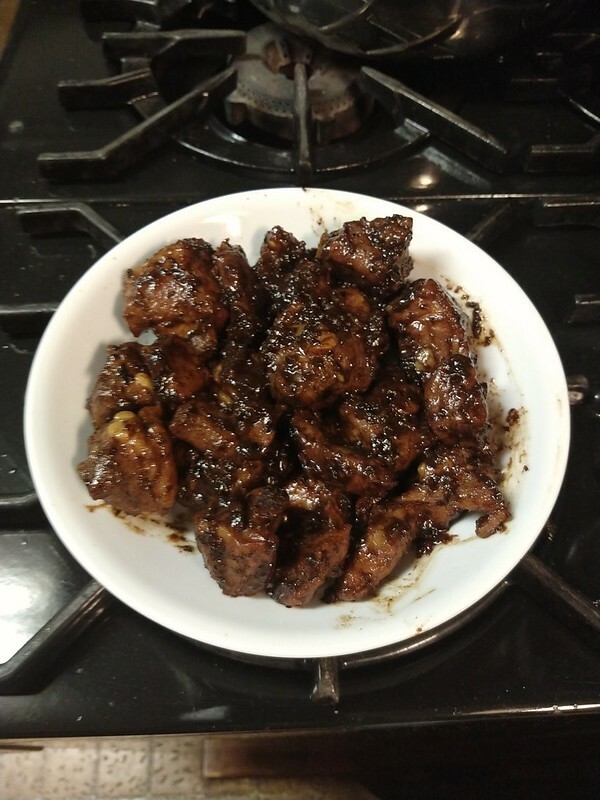 Tonight I made a batch of spareribs in black bean sauce. Mentioning those black beans on another thread made me think of these, plus, it was 62º out, and putting my exhaust fan on high doesn't matter as much then, as when it is 16º out! I didn't eat even half of these, so there are some left over for Chinese New Year, starting Tuesday. Mom had a shrimp & flounder combo plate with french fries & cole slaw from a local seafood place, I had a shrimp and scallop plate with a salad and corn nuggets from same seafood place. 12-layer chocolate cake for dessert - Mom and I split a slice. Mmm, that looks good. Do you have a recipe for the black bean sauce? I remember having snails in spicy black bean sauce years ago that was delicious. You'd peel off the foot pad, and use a pin to pull out the little bugger inside. But the sauce that they were tossed in really made it. I just happen to see similar little snails in the Ridgefield H-Mart, so I'd love to try to reproduce the dish. Had a nagging headache most of yesterday. I went to audit the Plant Pathology class with our new group of master gardener students, but had to leave early because the headache came back. DH heated up leftover sloppy Joes from the other night and made steamed buttered green beans to go with it.